Lee Da-hae Drama “The Good Witch” Premiers Tonight on SBS and Releases Long Preview!! SBS released 4th teaser for their upcoming weekend drama “Nice Witch“. I am glad that we are finally having a teaser exposing more of the setup and the other characters in the drama and I think they did good job editing it to deliver that. In general I do like this teaser specially how much Lee Da-hae is embracing her housewife look for Sun Hee not only in her makeup or messy hairstyle or outfits but also in how she is standing (ex. the scene in her sister’s empty apartment) and how she is running. I am also starting to wonder if they will make Do Hee tell Sun Hee the whole details about what she got herself involved in before getting into coma or Sun Hee will have to discover it herself and so she will also be a woman on a mission as she replaces her sister at work?! I am certainly curious about how the plot will come out and I will keep praying and hoping that “Nice Witch” won’t disappoint us!! More Teasers for Lee Da-hae’s Drama “Good Witch” Released!! We are finally on a roll with “Good Witch” promotions and we even got 2 more teasers!! From the drama short description and some news reports, they do describe our main character, the housewife “Cha Sun Hee” as “호구/Hogu” which is a slang means a stupid person!! May be they mean that she is too kindhearted that some may think she is stupid since she cares too much about other people and treats everyone’s problems like her own which might get her into trouble and bad situations but at the same time I really don’t want them to go over board with that concept showing her doing some silly and stupid actions just for the laughs, I want to see a hardworking heroine that can make things right even if she is not all that smart. Seeing Lee Da-hae challenging herself in this duel role for the first time, I am praying her effort will pay off. OH Drama, PLEASE BE GOOD!! SBS finally released something about “Good Witch“, PHEW!!! 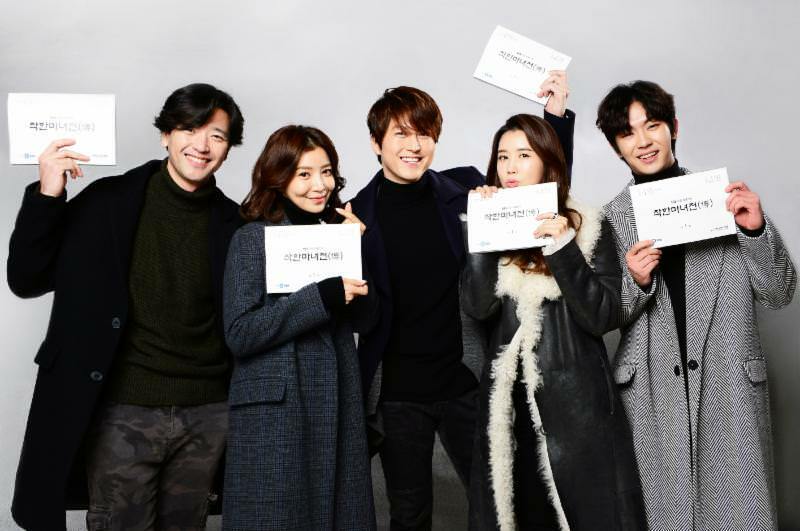 And today we finally got the pictures of the cast first script reading which was held back in December and seems it was held at the same day they took those initial pictures we saw before. Recently both idols Shin Hye Jeong (AOA) (pictured above) and Ahn Sol Bin (LABOUM) has confirmed their casting in the drama and both will be playing flight attendances who are working at the same company as our leads. Actress Moon Hee Kyung was confirmed to act as the mother of Ryu Soo Young’s character in the drama and you can also see actor Shim Hyung Tak in the picture above, he will act as “Chae Kang Min” the husband of Yoon Se Ah‘s character which is the oldest daughter of the airline company’s CEO (Lee Duk Hwa‘s character) and he will also be working at the company as the chief of Airline Strategic Planning Division. While I really hoped we get new teaser this week but I thought it would be hard to have more than 4 teasers for the drama and we will have to wait for the long preview or the first episode preview to see new scenes of the drama. But the good news that the production team behind “Hotel King” drama didn’t disappoint me and not only gave us new teaser but also included in it all what I wanted to see and mentioned before. So, we got many cute, funny and swoon worthy moments between our leads Lee Da-hae and Lee Dong Wook and also got to see more of our second leads and the rest of the cast. YAAAY!! With only two weeks till its premier, “Hotel King” releases a new still of Lee Da-hae as the drama heroine “Ah Mo Ne” the heiress of CIEL hotel. I really like that they are explicitly mentioning that Da-hae role here is different from Joo Yoo Rin because it gives me the feeling that they really want to show something different and I am surely looking forward to see how my girl will portray this character. Totally opposite to what we saw in the first teaser of “Hotel King“, these new teasers for both Lee Da-hae and Lee Dong Wook characters are showing much more intense, dark and melo vibe. We surely expected to see melo but I was still so surprised with what we got to see from these teasers. I actually like that we don’t see a single tone from this drama till now as we got to see funny and amusing moments and also some melo and heavy moments. So, I really hope they keep this during the whole run for the drama.